Andrew McGregor continues the annual day of music for Holy Week, including concerts from Copenhagen, Prague, Berlin, Guildford, Amsterdam and Sofia. Andrew McGregor continues the annual day of music for Holy Week, with live and specially recorded concerts from around Europe. The BBC Singers perform Stainer's oratorio The Crucifixion, live from Guildford Cathedral; a venue for which conductor Barry Rose founded the cathedral choir back in 1961. Ton Koopman conducts the Royal Concertgebouw Orchestra and the combined voices of the Netherlands Chamber Chorus, Amsterdam Baroque Chorus and Netherlands National Children's Choir in Bach's mighty St Matthew Passion. 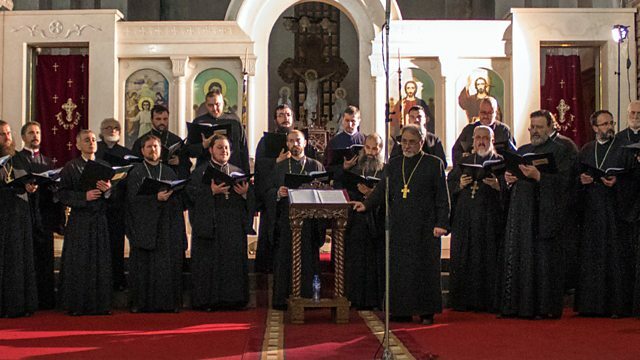 Photo of Sofia Priests' Choir at Saint Sofia Church (c) Martin Mitov, March 2018. Choir: Tonus Peregrinus. Conductor: Antony Pitts. Choir: Choir of King’s College, Cambridge. Conductor: Philip Ledger. Lyricist: Cecil Frances Alexander. Choir: Choir of King’s College, Cambridge. Conductor: Philip Ledger. Singer: Tomáš Král. Ensemble: Collegium Marianum. Director: Jana Semerádová. Performer: Martina Bernasková. Ensemble: Collegium Marianum. Director: Jana Semerádová. Orchestra: Berlin Radio Symphony Orchestra. Conductor: Robin Ticciati. Singer: Alice Coote. Singer: Mariusz Kwiecien. Choir: Rundfunkchor Berlin. Singer: Peter Auty. Singer: Jeremy Carpenter. Choir: BBC Singers. Choir: Guildford Cathedral Choir. Performer: Malcolm Archer. Conductor: Barry Rose. Conductor: Ton Koopman. Orchestra: Royal Concertgebouw Orchestra. Singer: Tilman Lichdi. Singer: Manuel Walser. Singer: Christina Landshamer. Singer: Ann Hallenberg. Singer: Mauro Peter. Singer: Klaus Mertens. Choir: Netherlands Chamber Chorus. Choir: Amsterdam Baroque Choir. Choir: Netherlands National Children's Choir. Singer: Maïlys de Villoutreys. Performer: Juliette Hurel. Ensemble: Les Surprises. Conductor: Louis-Noël Bestion de Camboulas. Choir: Sofia Priests' Choir. Conductor: Kiril Popov.